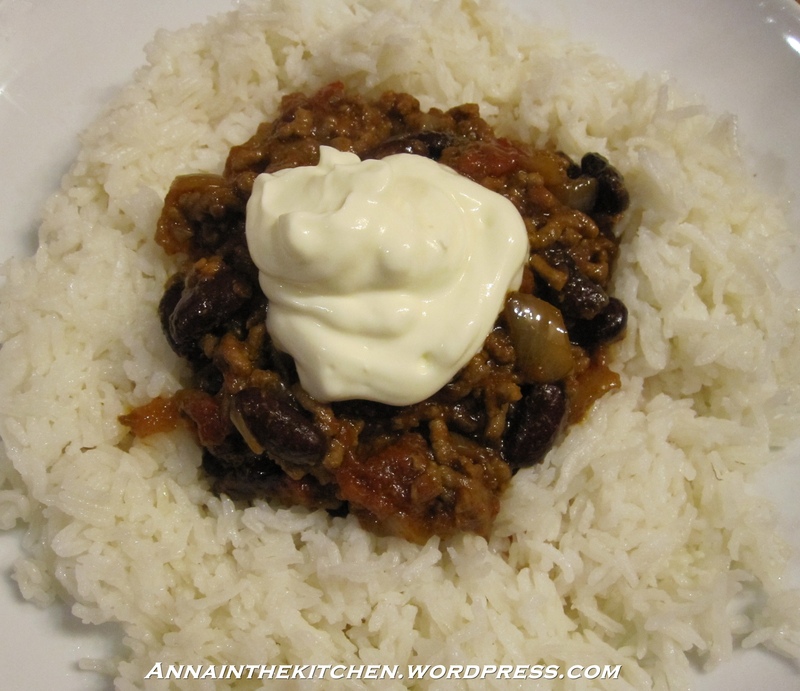 I think my dad has been cooking this Chilli Con Carne recipe since before he met mum! The original recipe comes from this ancient ’70s St Michael’s cook book but it’s one of those family dishes that no longer needs a recipe, we just get on with it. I like this recipe as it’s a nice, tasty and warming way of getting more pulses in my diet and I’m trying to get away from eating so much pasta so rice makes an excellent staple carb alternative. My dad’s a bit of a spice maniac it has to be said. Back in his army days he once drank coffee with Tabasco in it and declared it to be delicious! I, however, am not so fond of chilli, I like a bit of spice, sure, but I like to be able to taste the food that comes with it and noone likes to eat a meal with their nose running constantly. So spicy food is always a bit of a compromise in our family. We aim for somewhere in the middle and I cool mine down with yoghurt or creme fraiche and dad adds Tabasco to his. Not the best photo, it's all a bit white! – Heat a few tbsp oil in a large pan. Add the onion and garlic and fry until soft. 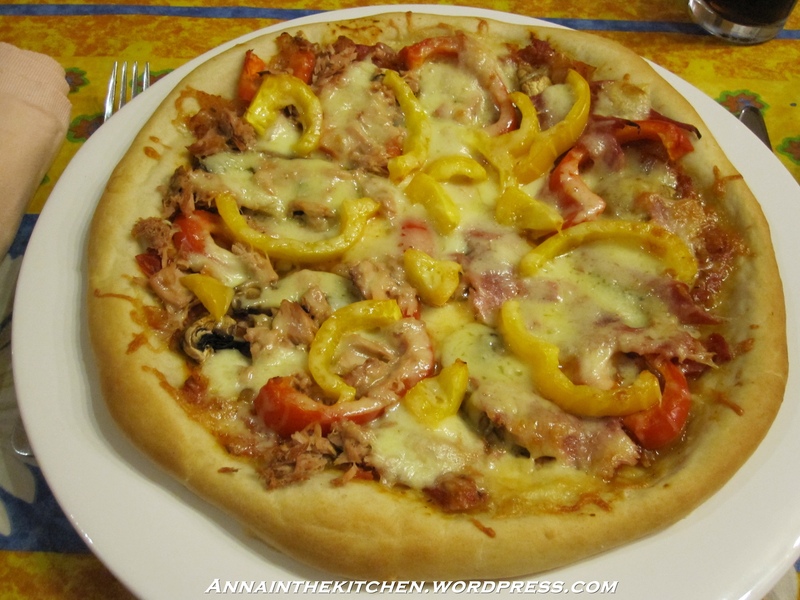 – Add the minced beef, chilli powder and chilli. Cook until browned, stirring occasionally. – Add the tomatoes, beef stock, tomato puree and sugar and stir until well combined. 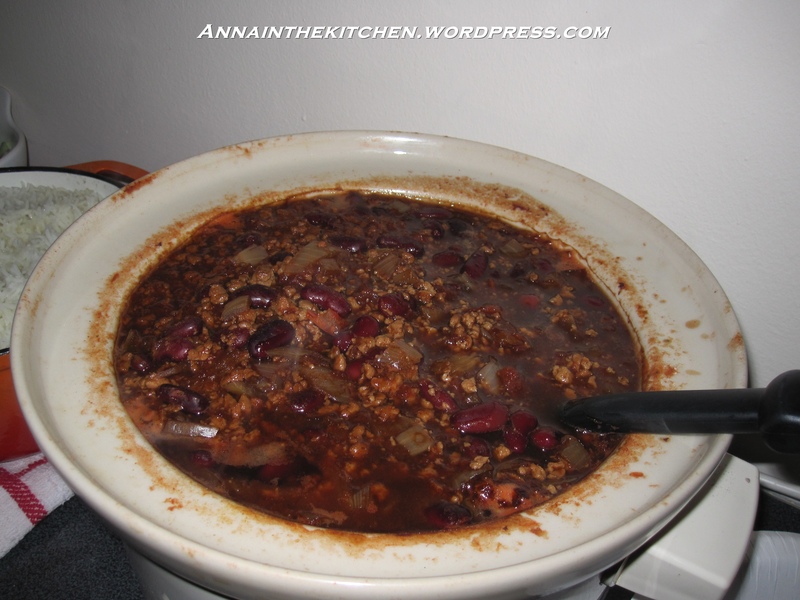 – Add the beans and cook for another 5 minutes. *Normally we cook it up to this point early in the day or evening then leave it standing until dinner time when we heat it up again then add the beans for the final 5 minutes. A staple meal in our house. 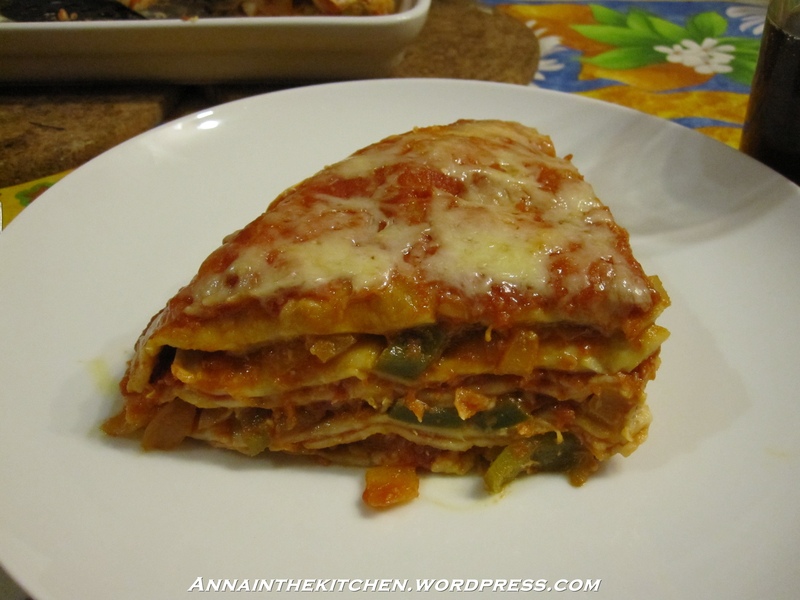 The recipe varies a little each time I make it but this is tonight’s recipe! There’s not much to say about it really, it’s a simple warm filling year round meal. – In a large bowl mix together the minced beef the insides of the sausages (discard the skins), half the onion and 1 of the cloves of garlic along with 2 tbsp herbes de provence and salt and pepper to taste. Get in there with you hands! – Shape the mixture into balls with your hands and place them on a floured plate or chopping board. – Lightly dust with flour and leave to rest for at least 30 minutes, preferably in the fridge. 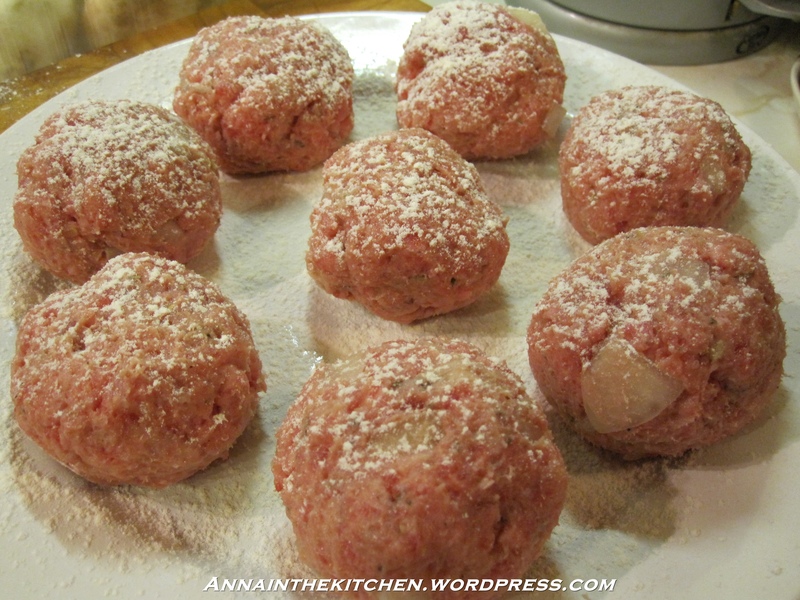 – In a very large deep frying pan brown the meatballs, in batches if necessary. 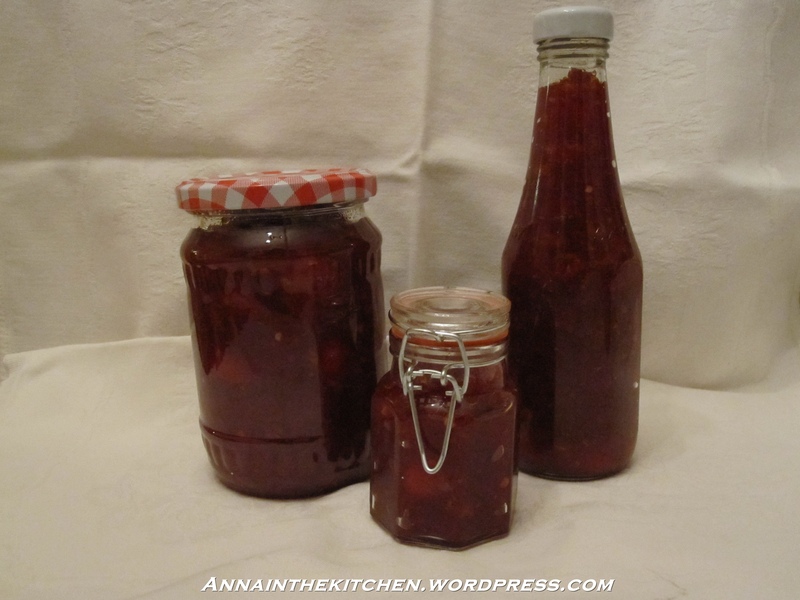 – Once browned on both sides tip in the tinned tomatoes with a quarter of a can of water. Add the tomato puree, ketchup and mushrooms as well as another tbsp of herbes de provence. 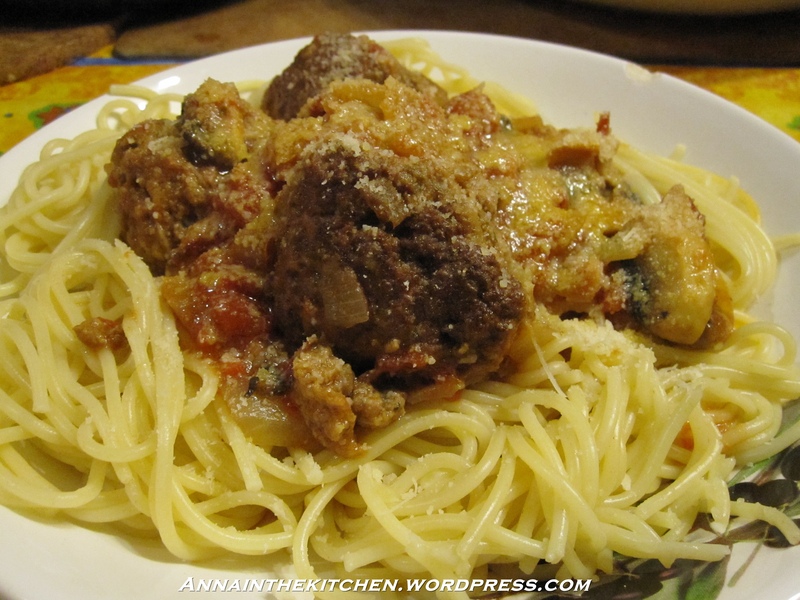 – Gently stir the sauce to mix in the space between the meatballs and poke the mushrooms down into the liquid. – Put on a lid and leave for 15 minutes until the sauce is bubbling. – Take the lid off and continue to simmer for another 45 minutes on a gentle heat stirring occasionally. 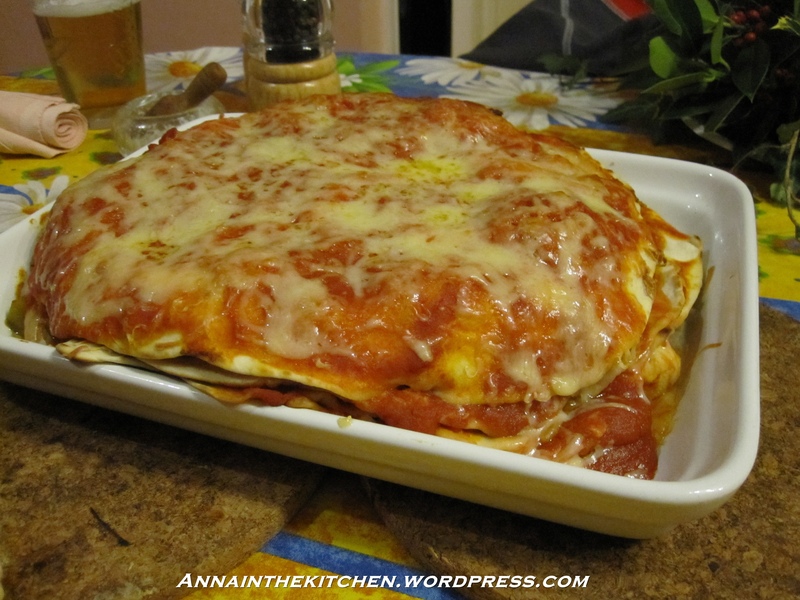 – Serve on top of spaghetti all covered in cheese! *Better yet use a pack of sausage meat, preferably from a butcher, rather than already made sausages. You will notice such a difference if you do. Alas it was a thrown together meal tonight so no sausage meat.